-Notice- I had a Revelation and am Switching the game to Pokemon in Honor of the Soulsilver and Heartgold that just came out!!! Bio: Silver Awoke. He Yawned. "Why can't I ever not be tired" he said in monotone. He scrambled for the clock. It was only 6:00 AM. He had one more hour until he gets to choose one of three pokemon from Prof. Elm. "I know which one to choose, I want a Cyndaquil!" Silver Walks around aimlessly. The Clock Struck Seven. "Time to go!" He shouted, "Bye Mom! I'll visit after I choose my pokemon!" He Ran Off. At Professor Elm's, There was only two pokemon left. Silver darted in the door. "You were almost late, Silver!" said Prof. Elm. "Sorry, Professor, my Mother made me eat a large breakfast" said Silver, in a sarcastic tone. "Well, Silver, You're in luck! The Pokemon you wanted is one of the Only two left!!!" proclaimed Prof. Elm. "You mean?!" gasped Silver. "Yes" said Professor Elm, "Cyndaquil is all yours". And So, Silver's Journey begins, what comes along farther into the future, only time will tell. Duty (s): Adventuring and keeping himself alive. Weapon(s) (Optional): Thorn has two weapons, Reapers revenge, a katana imbued with the power of earth and, Sols fury, a dagger imbued with fire. Characteristics: Auburn hair with brighter orange in the front. Several scars on his hands from sword wounds. Personality: Prone to become depressed and indifferent. Alternatively he can be very positive, also is intelligent. 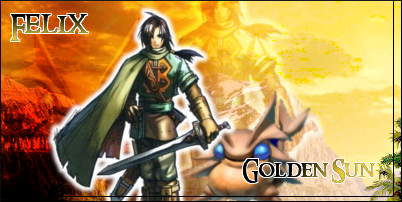 Bio: Long after the events of Golden Sun: The Lost Age, Thorn was born. He was a descendant of Felix and had inherited the power of Earth as a Venus adept. When he was 16 his father came to him and told him that it was time for him to go explore the world and gave to him two djinns, Echo and Sol, to help him. So he went taking his two djinns after a year of adventuring he had found some money and his two weapons. Yet he began to wonder what else there was, were there other people living in other places? These things he wondered as he looked at the stars. Now we just need to get maybe a few more people and to figure out how to start. Sooooo ithas tp be from Nintendo 64? Any Nintendo game silver! You can choose! Whether it be Pokemon, LoZ, Mario, Pikmin, etc...!!! Personality: Mostly Happy, Huge Fan of The Legend of Zelda Series, Prone to Saying "Hooah"
Bio: Dave was born prince of Hyrule after the events of OOT. As all people, he had heard the legend of the hero of time who had defeated Ganon with the Blade of Evils Bane. After hearing the legend, he was determined to make his own. He set of at the age of 4 with his roomate/sidekick/friend/backup friend to fight evil much as Link had. Armed with a Kokiri Sword, Hylian Shield, and the hero's clothes, he wanders the land in search of challenge from Ganons left over forces. Just as a suggestion maybe your character should be older than four because children at that age cannot do very much or fight, anyways it's just a suggestion. you dont know that, dude. Just out of curiosity, why wouldn't I know that? Besides I live with four year old children anyways I didn't say you had to, it was only a suggestion. how many 4 year olds have u met that where from hyrule? fine. if it makes you happy, he can be 16. can i play now? He could have been 4 if he wanted to. I usually hate RPs like this (you know ones, that directly copy the context from LoZ.com) so I doubt I'll join. k everyone. how bout instead of fighting over age limits and copying from LOZ.com we try to get more people to join this RP so we can get started. Well...it's been a while since anything happened here. We give up on this or what?